Whether you started writing your novel using the template or by formatting your existing document, you should now be ready to move to the next step and convert your document to an eBook. This particular step is a one-way trip though. That means that once you start this process you are going to sever the relation between the eBook and the original Word document. 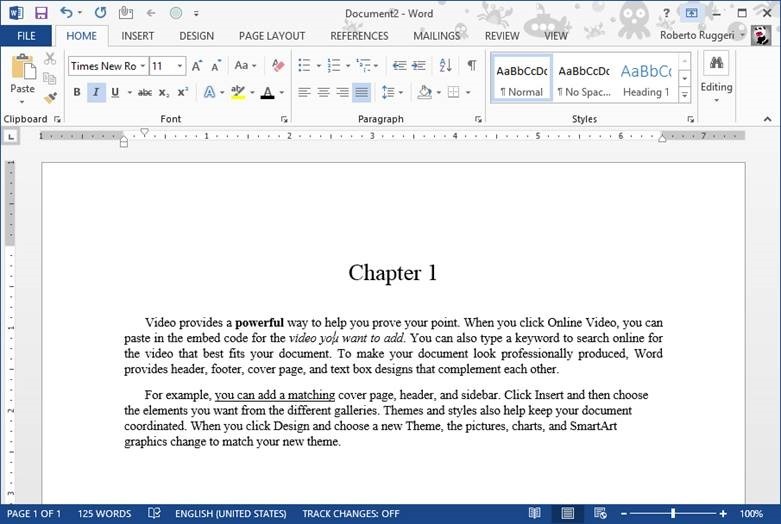 Any changes you need to make to the Word document you either need to make them both in Word and in the eBook – if there are a small number of them – or repeat the formatting process from this step forward again. Thankfully, the rest of the process is pretty mechanical and, with a little practice, it should not take you long to format a document from scratch. Before we start we need a couple of tools that we’re going to need in order to convert the Word document into an eBook ready for publishing. The first tool is a nice little gem called Sigil. To download Sigil go to the Downloads section of the site and click on the file that says “Windows” or “Mac” in the title depending on your platform. The latest version at the time of writing is 0.7.4. Sigil is an open source project and it’s free to use. Unfortunately, development of Sigil has stopped as of October 2013, but the tool works extremely well for our purposes and we’ll keep using it until it does. Sigil will help you take the output from Word and turn it into an ePub file. ePub is the industry standard format for eBooks, used by many publishers. The second tool we’re going to need is Amazon’s Kindle Previewer. Also available for Windows and Mac, Kindle Previewer will convert the eBook from ePub to Amazon’s proprietary mobi format for publishing to Amazon’s KDP. Kindle Previewer will also allow you to preview the final eBook simulating a number of different Kindle reading devices. · There are no page breaks between chapters and that text flows from one chapter to the other. If you have left page breaks we’ll take them out during eBook formatting, but it’s better to do it in Word. The eBook template includes all the sections and the appropriate formatting, feel free to add or remove sections to match what you want in your book. Ok, now we’re almost there. One last check. Make sure everything is all right. Save the document one last time and close it, just to be sure. Open the document again and go to File, Save As. Pick a place where you want your HTML document to be saved. From the “Save as type” drop down pick “Web Page, Filtered”. This step is super important as by choosing the Filtered option, Word will remove a ton of extra formatting that we do not need, or want, in our HTML file. And we’re done for the day! Congratulations, you are one step closer to publishing your masterpiece! Next week we’ll work in Sigil to create the ePub. Until then please let me know if you have any question @robertoruggeri. Ciao! Last week we talked about how to create a template for all your new documents. You can read the explanation of how to put the template together in the last article or get the one I prepared for you. Using the template will allow you to reduce the time actually spent formatting the document for publishing. Sometimes though we cannot start from scratch and we already have existing documents or documents that someone else gave us. In this article I will explain how to determine if there is a problem with the document you already have and, if indeed it needs work, how to turn it into a document that can be easily prepared for electronic publishing. The first step is finding out if there is a formatting issue in the first place. As we discussed multiple times, the major source of problems will be manually applied formatting other than the simple bold, italic, underscore etc. I can already tell you this document is going to be a problem. How? Just check the type of font used for the paragraph and look up in the Ribbon for the Normal Style. As you can see, they are different. Same for Heading 1. This document has a lot of manual formatting that will become a problem later causing your eBook not to scale text correctly or not allowing the reader to change font face and potentially other problems. Then click on the little arrow at the bottom of the list with all the text and paragraph styles. This will bring up the Styles window. At the bottom of the window you’ll find the button for the Style Inspector. 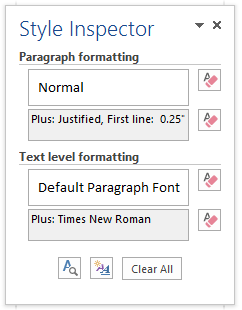 When you click on any text in your document, the Style Inspector will tell you the default paragraph and text formatting plus any paragraph and text formatting that has been applied manually. In this example you can see that default formatting for the paragraph is Normal and that text justification and an indent for the first line have been manually applied. You can also see that the default formatting for text is the Default Paragraph Font, or the font assigned to the Normal style, and that a manual font of Times New Roman has been applied. For a document to be all right, there should not be any “Plus” formatting applied. The formatting of the paragraph and the text needs to reflect the formatting of the Style that is assigned to it, with no additional changes. If in the document you have two pieces of text that need to be formatted differently in the final output, they should have different styles applied to them, exactly like we did in the last article when we created a style for the first paragraph in every chapter and a style for centered text for the paragraph separators. Because manual formatting can happen at any point in the document, you might have to go through it page by page and check if there is anything suspicious such as different fonts, different paragraph spacing and indent etc. In general look for anything that seems out of place or looks different from the text around it. When you find something, use the Style Inspector to check if there is manual formatting applied to that sections by clicking on it and activating the Style Inspector window as described above if you do not have it opened already. At the end of this process we should be able to tell if the document is properly formatted. If you did not encounter any manually formatted text and everything matched the corresponding Style formatting, then you are good to go. Great! If that is not the case, you have several options depending on the extent of the changes you need to make and the length of the document. If you are dealing with a few fixes here and there, the best way is to select the text or paragraph and apply the appropriate Style. To do this, select the text you want to change and click on the Style you want: Normal for the body of the document, Heading 1 for the chapter headings. Pressing the “Clear all Formatting” button will remove all the formatting from the selected text and return it to the Normal Style. Only use this method if you are absolutely certain that you are not using any formatting such as bold and italic on purpose. If you want to use other styles such as the one for centered text of the one for the first paragraph in the chapter, you’ll have to define them in the document as I explained in the last article. I must say that in the vast majority of cases you’ll really need the two styles for the text and the chapter headings. And you definitely should start there. The beauty of eBooks, among many other things, is that they are not a static medium like a print book. You can modify the book at any time and all your readers – present, past and future – will get the new version. So, especially for the first few documents you format yourself, stick with the basics. If you are dealing with a large number of changes, the best and quickest way to get back on track is to select all the text in the document and paste into the document template we created in the last article while merging the formatting. 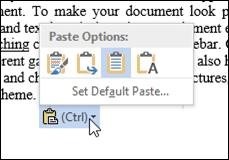 · Copy the selected text to the clipboard by pressing the CTRL key again, hold it and press C (CTRL+C) for Copy. Now all the text in the document is in the clipboard, ready to be pasted somewhere else. · Press the CTRL key, hold it and press the V key (CTRL+V) to paste the contents of the clipboard in the template document. · Once you paste the text, it will look exactly like in your original document. Click on the little icon that says “(Ctrl)”. From the menu select the second option or Merge Formatting. Alternatively, as soon as you paste the text, press the CTRL key again and then the key M.
This will leave you with a plain document all formatted using the Normal Style. All the text formatting such as Bold and Italic will be preserved. All the manual formatting that was applied to the paragraphs should all be cleared and we’re now almost in a goods spot again. The only thing left to do is to format the chapter headings with Heading 1 and, if you want, the first paragraph in the chapter to First Paragraph Style which is already defined for you. Don’t forget to save the document with a different name by going to File, Save As and choosing an appropriate name. I usually pick the title of the book and append the word “_FINAL” to signify that this is the document I will use for formatting. · Chapter headings are formatted with Heading 1, no manual formatting applied. · The body of the document is all formatted with Normal, no manual formatting applied other than text level formatting such as bold and italic. · Optionally the first paragraph of each document is formatted with First Paragraph. · Optionally the paragraph separators are formatted with Centered Paragraph. This concludes the stage of preparing the document for formatting. The companion video to this article is here. Now we’re ready to go to the next step and leave Word to dive into other tools to assemble the different pieces of the eBook together. Since every printed copy of a specific book looks exactly like the others, you can format your work with that in mind and optimize as much as you can for readability. As a formatter you have full control of what the reader will actually see and experience throughout your print book. This is quite different for eBooks. Most eBook readers, like the Amazon Kindle devices, will allow the reader to control these aspects of the reading experience providing the user with unprecedented control compared to the traditional paper medium. Readers will expect your eBook to behave in a certain way when changing font sizes or font faces. On the side you can see an example of the text appearance dialog for Amazon’s Kindle Fire HDX. 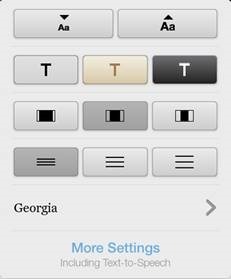 From here you can control the text size, the background, the margins, line spacing and the font face. In some Kindle apps you can also control the number of text columns per page. Common issues with a poorly formatted eBook are fonts not resizing or font face not changing despite the reader changing the settings, problems with font color like a white font on a white background, problems with pictures being too big or too small, etc. This is in my opinion a bad experience. Some books might have a need for fixed formatting, with a specific font and font size. In those cases it’s really important to understand that the reader might be confused and due to the extremely large number of devices and screen sizes, you might run into formatting issues that actually make your book harder to read. Not something you generally want. Formatting an eBook is a crucial aspect of the publishing workflow and needs to be taken seriously to make your product look professional and provide the reader with a great reading experience. After successfully testing the eBook you will have your content ready for publishing. About me: I am a technology freak, that’s pretty much it. I spent pretty much all my life in Information Technology. 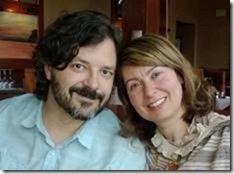 I started working for Microsoft in 1998 and I am still there making up the future of Xbox. When I am off work I play videogames, but every day that goes on I feel more like a videogame collector, I wish I could play them all. I am an amateur photographer, a Canon guy really, and a comic book collector, X-Men FTW! You can find me on twitter, Xbox and PlayStation Network and I have some photos up on Flickr if you want to connect. When Monica started her book business we looked at all the different components of the workflow, from inception to publishing and marketing, and decided how to tackle each phase. We wanted to have a professional approach and put out on the market a polished product. Some parts were clear: she does the writing, you need a professional for the editing and you definitely want an extra pair of eyes for the final proofreading. The last part to figure out was how to get the manuscript from its raw format to a format that could be published on one of the online services like Amazon, B&N/Nook, Kobo etc. We looked around the room and thought, who has some background in publishing and IT that can get help with this?? She looks at me. I look at her. I look at me. I decided that it was me, the one with 25 year experience in IT, who should take this. The skills in setting the clock on my parents’ VCR and fixing remote controls prepared me for this and I was ready to support my better half in her new venture. I went into it without much knowledge of the process and I have learned a lot. Now we can take one of Monica’s books from the original document to formatted and uploaded to the service in a matter of few hours. This is meant to be a series of articles and practical advice on how to publish your work online and have it look good on your readers’ e-devices. I will be focusing primarily on publishing to Amazon’s Kindle format which I believe will cover 90% of the cases. I’ll start with the basics of editing and how to prepare your document for formatting. We’ll then have a look at the tools for formatting and finalizing the document for publishing, including all of its metadata. Finally look at some of the variances for different online publishing services like Smashwords and Createspace for print-on-demand. If you have any questions or have suggestions for topics you’d like to see covered, feel free to hit me on Twitter @robertoruggeri or Monica @momilp. For now get ready and let’s start with the basics and why formatting is important. Yesterday, I contacted kdp’s support and reported that The Priest was free on iTunes and Barnes & Noble. A few moments later a representative answered, telling me they had already matched the price of the title to $0.00. 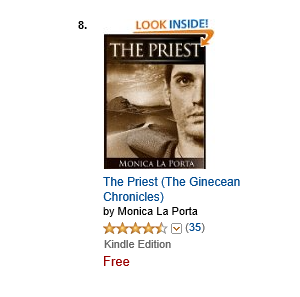 At last, The Priest is officially free everywhere, and since yesterday downloads are trickling in. Below are the results I recorded as soon as the rank appeared. Hopefully, they won’t plateau as they have done on Smashwords, where there’s barely a download a day. Well aware I have a niche product, I am not expecting the thousands of downloads other titles experience, but I’m hoping this is the first step in the right direction to have the series noticed by readers who might be interested in my flare of dystopian. I should have written down the time of day the changes in the rank happened, but I’m in writing mode and only had time to copy paste from the Amazon page. 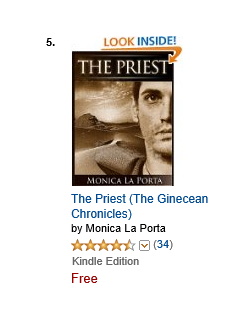 TLDR: At the moment, 10:00 pm, The Priest has been downloaded on Amazon.com 576 times and has reached #5 in the free science fiction bestseller list. The Prince’s Day Out’s promotion was a complete fiasco, but despite that I let Linda of the Night, my sweet short story (22 pages) to run its Kindle Countdown promo as scheduled. The short is currently priced 99 cents. I like the countdown window that tells you when the price is going to change, and I like the idea of the exposure on the countdown page. This time, I found my title right away. Linda is on page 4. But after selling only one copy, I don’t think there is enough traffic on those pages yet, and I cancelled Pax in the Land of Women’s countdown campaign. Did I miss another train or did I hop on this one too soon? It doesn’t matter. The journey is what is all about.